Throughout the millennia, the earth has gone through long periods of warming and cooling. The entire Pleistocene Epoch – beginning about 2MM years ago was marked by invasions of massive glaciers interrupted by warming periods. Dating of the most recent glacial advance varies but is usually described as reaching its farthest extent 20-30,000 years ago. 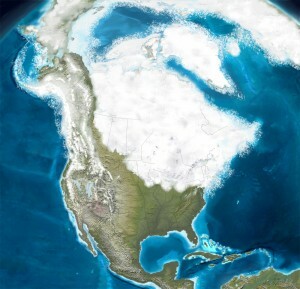 New York and New England were, by about that time, covered by grey glaciers that were up to 10,000 feet deep. What would have been left behind as the Earth warmed on Berkshire county would be marshy tundra for thousands of years. It sucked up enough moisture to lower sea levels by as much as 300 feet and wiped out any plant and animal life that had existed before.